Pie Fight ’69 | Sam Green | Sam Green - Sam Green is a documentary filmmaker. He’s made many movies including most recently <i>A Thousand Thoughts</i>, a live cinematic collaboration with the Kronos Quartet. Previous “live documentaries” include <i>The Measure of All Things</i> and <i>The Love Song of R. Buckminster Fuller</i>, featuring the indie rock band Yo La Tengo. Sam’s documentary <i>The Weather Underground</i> was nominated for an Academy Award and included in the 2004 Whitney Biennial. On Wednesday night, October 22, 1969, a delivery truck arrived at the front of Masonic Auditorium, amidst the glamour and clamor of the opening night of the San Francisco International Film Festival. The driver, a husky pastry chef, apparently in a hurry, attempted to run a huge tray of creamy pies up the red-carpeted stairs. In the rush, the precarious arrangement of pies went flying, and, almost magically, the oddest assortment of characters descended—a nun, a football player, and a go-go dancer among them. What ensued was a most memorable yet virtually forgotten piece of San Francisco’s cinema history. Led by late filmmaker Peter Adair (Holy Ghost People, Word is Out), the band of radicals called themselves Grand Central Station. Their hope was to create a huge splash—a media event that would attract investors to the group’s numerous, unfunded feature-film projects. Staging a silent-era pie fight at the black tie event was also a perfect way to protest the bloated, bourgeois affair the Festival had become. Equipped with some half a dozen cameras, the group, numbering nearly thirty, emerged from the crowd of tuxes and gowns once the delivery truck (with “Grand Central Station Pies” printed on the side) arrived. As jesters, nuns, and mimes flung pies, towels, printed with the Grand Central Station manifesto, were supplied to any bystanders that got creamed. The pastry melee splattered across headlines for two days (“Hippies Invade Film Festival”); even Mayor Alioto heightened the coverage by wanting to charge the no-goodniks with a felony. Despite the huge amount of publicity generated by the pie-fight, no movie offers came in for Grand Central Station. Several months later, the members of group all went their separate ways. And the rolls of film they shot of the event were lost for almost 30 years, until San Francisco filmmaker Bill Daniel discovered them recently in an unmarked box sitting in a corner at Artist’s Television Access, an underground film venue. Pie Fight ’69 documents this wacky event, constructed from the original footage shot by Grand Central Station and from news coverage and personal accounts. 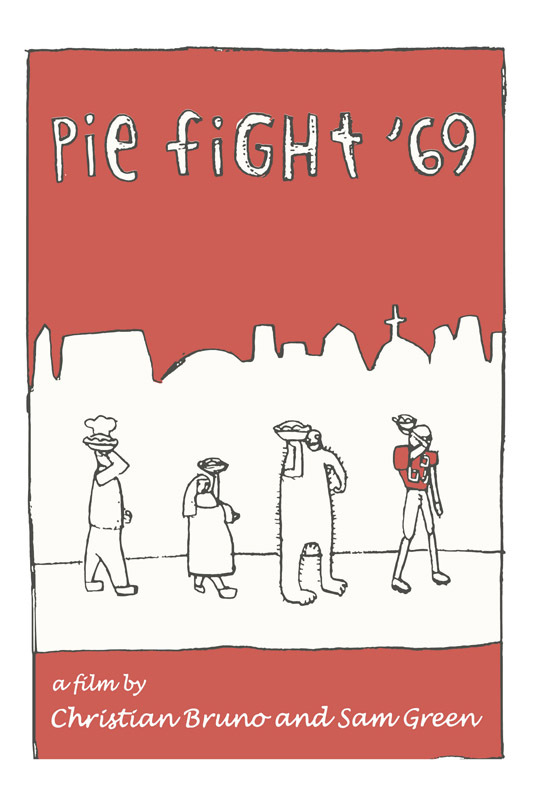 Preserving the seat-of-the-pants flavor of the pie tossing, Pie Fight ’69 attempts to bookmark a nearly forgotten moment in 60’s counter-cultural radicalism, as well as set a page in the histories of San Francisco’s underground film community and the SF International Film Festival.